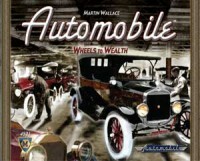 Automobile™ carries you back to the birth of America’s car industry, when inventors, craftsmen, and entrepreneurs created a wild array of marvels and misfortunes. You step into this rough, romantic trade hoping to create a fortune by building and selling cars. Tapping the talents of men like Ford, Sloan, Kettering, Howard, Durant, and Chrysler, you balance quality versus quantity, mass production versus premium branding, and innovation versus distribution and aggressive sales. Lose your balance and you go bust. Strike the best balance, shift the right gears to best your rivals, and you’ll be rich. You might even win. So, pull up your sleeves and start making cars! A friend of mine opened the box of Automobile the last weekend, being a totally unkonwn game for me up to that moment. As i work in automotive industry i was gladly interested on the game and so we started a game for 4 players. I have to say that the art on the game is quite nice, and completely ok with real history, as you will be playing with important personalities of the start of the automotive industry (Henry Ford of course) and the models you will manufacture and sell are also real ones. Also the game is quite quick to play, as it is only 4 round, with three actions for each player in a round. But soon enough you will be facing hard decisions according to the strategy you want to develop. The target, of course selling your models in bigger quantity than your oponent or at least with higher profit, according to the market demand. Yo start only with an amount of money to invest, and the winner would be the one who has more money and the end of the game. Lower the selling price of one of your models to increase the number sold. After your actions then the selling of the manufactured cars start, and here the strategy of the game is very nice and innovative. Cars are splitted in three categories: cheap cars, medium cars and luxury cards. First your will put your sellers at work and start to earn money for each car sold, but be carefull: it could happen that not all the sellers are able to do it, and in that case you will start to have loses. Briefing, i feel it is a great economy game, which some innovative mechanics that in this case are fantastic to get the feeling of the automotive market. Normally i like economy games but dislike that the theme could be anyone other and have the same game experience, but in this case the demand/sellers/market/model made me feel like a big CEO of the automotive industry. I guess that your first game, and your first turn, would be quite stressful as you will have lot of decisions to take from the very begining, but quite quickly you will get into the mechanics. So a great game to play for the economics guys! Add a Review for "Automobile"